We are happy to post our exclusive Pentax interview from CP+ 2019! We spoke with Iwasaki-san, manager within Ricoh Imaging's digital camera product planning department. We'd like to thank the community for providing a number of excellent question suggestions, many of which ultimately made it into the interview. It seems that for other major manufacturers, the current main focus is mirrorless. 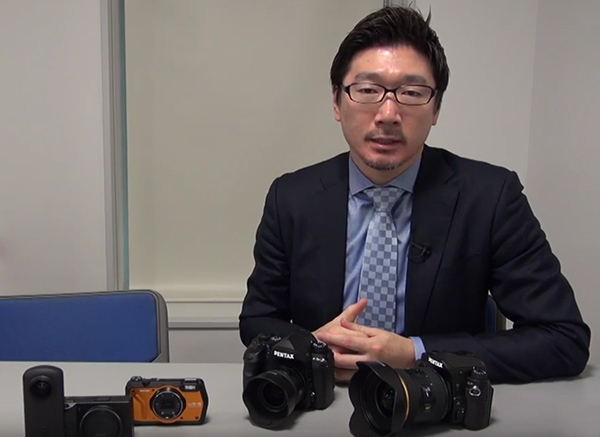 Beyond maintaining the products in the current lineup, what’s the main focus of Pentax and Ricoh? Where does Pentax see opportunities to differentiate itself? PENTAX has been focusing primarily on the SLR lineup, however we understand and are paying considerable attention to the mirrorless category. On the other hand, we also know that the SLR cameras have tremendous value in terms of enjoying (the act of) photography. I think it would be good if in the future PENTAX would be the brand through which we could communicate the sheer joy of taking pictures by enhancing services as well as the impression given to more discerning customers with the idea that photography is a great pleasure. Does Ricoh Imaging share the same negative sentiment some other manufacturers have on the future of the consumer camera market? If so, what is your strategy to adapt to changing market circumstances? How will this shape R&D going forward? With the consumer camera category, in particular the SLR category, we see that the consumer camera market is no longer growing like it used to. In such an environment, with regard to SLRs, and in addition to continuing to produce cameras and lenses that take and record good pictures, we think that extending services to increase the joy of taking photos or services to allow our customers to use products with confidence has become very important. We are working with a desire to make better cameras and lenses, but we also want to be a brand that will allow our cameras to be enjoyed for a long time, so we have been offering the K-1 upgrade service, firmware upgrades. We would like to provide services for users to use our products long term and we would like to continue doing such things in the future. The custom models exhibited at the CP+ this time are one of the proposals to encourage this new sentiment of "the joy of using cameras to take pictures". How do you see the role of the DSLR evolving over time? Do you believe the DSLR will remain a competitive product category in the long term? I think that the role of DSLR is shifting to be more emphatically a device to enjoy photography from a device simply for taking pictures. Unlike mirrorless, DSLRs continue to give value to users who want a more direct and intuitive experience from a device that allows users to feel the light and enjoy photo shooting. AI and computational processing techniques are playing an increasing role in increasing the performance of cameras, with smartphones now capable of achieving results previously only possible with high-end equipment. (Apart from dynamic pixel shift), are you exploring potential applications of such technology in Pentax cameras? Ricoh has already adopted deep learning technology for use in AE (auto exposure) to improve subject recognition accuracy. We are continuing research into and expect to use this technology also in connection with AF (auto focus) and SR (shake reduction) or image processing. Are you looking at applying any such techniques to improve autofocus performance? If not, what are your goals with regard to autofocus? As I mentioned before, we are using deep learning and artificial intelligence with auto exposure, which is reflected in our technology. However, at present, it is not in a ready condition for extending entirely to autofocus. As to that, after all, we hope to extend deep learning to have an impact on autofocusing and obtain a higher precision and higher speed focus in the future. Last year, you indicated that a new advanced APS-C DSLR (i.e. K-3 successor) was in development. Do you have any updates to share on this project? It’s in development. It is being developed as the highest (flagship) model in the APS-C lineup. Although we cannot provide specific information such as specifications or a release date, it is planned to be a very attractive product for current K-3 users. Has the response to the Pentax KP been big enough to make you consider continuing the high-performance compact DSLR line? Do you feel pressured by comparable, competing mirrorless cameras? There were a lot of very good responses from users who actually purchased a PENTAX KP. I feel very positive about that. Not only the K series user who wants a compact SLR, but also users who switched to mirrorless because of its portability only to once again recognize the merit of optical viewfinders and purchase the PENTAX KP. There are many such cases. How have users responded to the accelerator unit in the K-1 II? Do you believe it would benefit from customization options, such as enabling it at high ISO settings only? Many PENTAX K-1 users have applied the K-1 upgrade service and have seen an improvement. Additionally, according to our internal evaluation after photographing various subjects, the overall results are better with the accelerator unit. But it's also the case that on certain subjects, results without the accelerator unit can be better. We recognize that there is a demand for customization. However, this issue with the Accelerator is not just a matter of an on/off switch and I think it is difficult to deal with it. One current complaint from Pentax K-1 II users is that there is a lack of software that can handle dynamic pixel shift raw files. Do you have any plans for expanded support of such files (i.e. through third-party software or open source tools)? What about regular pixel shift files? The pixel-shift resolution function adopted on PENTAX K-1 Mark II is possible due to the PRIME image processing engine and is designed with complicated algorithms that make full use of various hardware processing abilities. Releasing functions using this image processing engine with a software package is actually quite a challenge, so currently we cannot find a solution to implement this using software only. Do you have plans to improve the stability of the Pentax SDK and expand its functionality? There has been a lot of user interest in apps for automatic focus stacking or automatic AF calibrations, but this is not currently possible with the SDK. Not much time has passed since we released the SDK. We are still at a stage of collecting information about how users are utilizing it now. If there is a strong demand from users, we would like to broaden the scope of SDK and we think that there is plenty of possibility. Do you have any plans to bring back the EVF to the Ricoh GR line? What about a hybrid viewfinder for a DSLR? On the GR, we prioritized the concept of a minimal and compact snapshot camera, therefore we did not adopt the EVF. Both EVF and OVF have their own advantages and the hybrid viewfinder seems to be the ideal solution with the merits of both types, but I also believe that hybrid viewfinders must not be allowed to detract from the good points of an optical viewfinder. There are very high hurdles to overcome. What are the top highlights of the GR III? Can we expect its technology to influence Pentax cameras as well? Many of the essential elements of a digital compact camera such lens construction, sensor and the image processing engine have all been redesigned and improved. On top of that, the camera features built-in Shake Reduction and 6cm close up shooting capability all while downsizing the camera's dimensions. Among these technical advances are some that can be extended to or applied to SLRs, and looking forward, we hope to improve our SLRs through implementation of these technologies. Both the DA* 11-18mm and D FA* 50mm lenses were delayed to ensure the best possible quality. What were some of the challenges in developing these high-performance lenses? We have set up a very high design performance index on these two lenses to ensure the best possible quality. It took time to suppress variability on the manufacturing side in order to deliver products to end users with good optical performance that is as high as it is designed to be. Following the release of the 11-18mm, do you have any other DA series lenses on a roadmap? If not, what is your plan with respect to the APS-C lineup? Would you see a 100-megapixel 645 body as an appropriate successor to the 645Z? We are carefully studying the market situation and customers’ needs. If there is a potential demand for super high resolution, 100MP would be an attractive option. Do you have any other updates for 645 users, especially professionals? As previously mentioned, we are carefully studying the current market situation and customers’ needs to reflect on the development of 645. Many users welcome the HD revision of the FA 35mm F2 lens. Do you plan to continue supplementing the high-performance full-frame lens lineup with compact/affordable options like the FA 35mm? Do you plan to refresh other (older) lenses, such as the original DA* line? The FF lens strategy so far was to introduce fast and high-performance lenses which makes full use of the performance the K-1 offers. The 35mm F2 is refreshed as we found that the renewal of the coating is effective to improve the total optical performance. We may apply this kind of update on other existing lenses. Lastly, we have to ask for the sake of our Pentax Q fans- is the Q line still on hold? We are aware that there are a great many Pentax Q users, however we are now focusing on the K mount and we would like to formulate our policy with regard to Pentax Q based on considering what we should do next and what would be most satisfying to our customers. 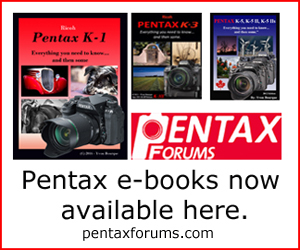 To members of PentaxForums, thank you always for using Pentax cameras. Regarding the quality of Pentax cameras, SLRs, and the joy of taking photographs using them, we will, working together with all of you, keep producing quality cameras, provide all of you with good service, and create an exemplary Pentax. We look forward to your continuing patronage. This concludes our CP+ 2019 Pentax interview. We will follow-up with a commentary post, in which we plan to make any clarifications as a result of user comments. Tell us what you think in the comments below!